2016 is here and it's time to get the /party started! Log in this weekend to find new releases in all our main games... PLUS the Pre-Beta for AdventureQuest 3D is happening right now! If you haven't checked out our newest game, head on over to help us build it from the ground up! Nulgath the ArchFiend's Birthday: A Call to Arms! The planes of Lore and the Oversoul are approaching alignment! Answer the ArchFiend’s call to strengthen the link between dimensions and battle to claim your rewards! Surprise! PRE-BETA launched early. Kickstarter backers with EARLY ACCESS and players who have supported previous Artix Entertainment video games are welcome to join in this exciting new phase of testing. Just... click... HERE! You have character pages now! Alpha Knights can pick up their armor from Melodia in Yulgar's Inn. Quests to get the rest of the pieces coming semi-soon. Onward, to PRE-BETA... for great justice! Tooty Void Challenge and Custom Titles! Somehow Mama Fruitcake Zard, Tooty, has found her way to the present - and even received a new hat! She'll be waiting in The Void for the very brave... or foolish. Also don’t miss CUSTOM TITLES coming to the 12000 Z-Token package this week! Give your character page some unique flair with a custom title. Includes the ability to select any color you like and up to 100 letters. Poor Twig! You had to beat up his best fwend to stop the ice cream invasion of Frostvale! Maybe you can ask around and find him a new fwend? Help cheer up Twig! Classic and new New Year’s weapon shops are in your Book of Lore! Grab your Frostval presents before they’re gone! "The end is neigh!" + Party! AdventureQuest 3D testers... party like it is the last weekend of Alpha Testing. Because... it is! Alpha testing will officially conclude early in the morning on the Tuesday, January 12th, 2016. This is the exciting end of the game's infancy... and the first steps towards the next exciting phase of game development! Your Alpha Knight gear will be waiting for you when the servers come back up later that week for the official start of PRE-BETA! 3 cheers for our Alpha Testers! Thanks to all of you testers and your amazing feedback we created a lot of features and fixed A LOT MORE bugs! In the Alpha we added classes, Greenguard forest, Doomwood, redesigned BattleOn #2, interiors including Warlic's Magic shop, Class Training Hall and Cysero's forge. We have added lots of monsters including our first boss monsters, the Undead Terror. We finally created a logo. We added the band, the slime pit, and most importantly... our first quests! We added a ton of new animations. Also new weapons, hair styles and some awesome armor sets. We created the www.AQ3D.com website, account management, and our first round of character pages-- new ones coming next week! We redid ALL of the maps upgrading to Unity 5 with the new lighting system. Just yesterday we got light probes working and shadows for the PC/Steam version. The Kraken bug... may hiw white arm things rest in peace. Getting dev-only IPhone, iPad, Android phone and tablet, PC and Steam staff testers all playing together in the same room for the first time... taking a photo of it and not thinking to make a video. Our first ever team live Strema on Twitch! "Because it is a lot easier to say than 'extended Phase II Alpha-like redux''"
PARTY LIKE IT IS THE END OF ALPHA! "Farewell pink buggy alpha hair... now, you will only haunt my nightmares." Judged by the Creators of Cookie Clicker! When you think about it, it is pretty meta to have the creators of a cookie game judge a real life cookie contest based on another series of games. Here we go! Thank you to everyone who participated in this years Cookie contest. We loved all of the entries. Please give the winners a round of cheers and get ready for the next contest which will start soon. What kind of contest should it be? NOTE: Prizes will be awarded over the next week. Ring in the New Year with epic boss battles, free server boosts, and awesome rewards! New Year 2016: New Year, MORE FEAR! Take on Goregrim's army as the Queen of Monsters' minions attack Northpointe! Frostval Fruitcake and Undead War! Frostvale is being raided by the combined forces of Stollen and Zorbak. We need you to help save the very origins of Frostval! And in honor of the new Star Wars movie, the Kallus Knight Face is in Warlic’s Shop - only available until the end of the year! The Fallen King Set will also be gone forever at the end of the year! The Donation contests for Kibbles and Tibbles also ends at the end of the year! Cyclone Guardian Dragon armor also goes rare at the end of the year! Power Holiday! Double XP and Credits starting Christmas Eve (December 24)! 29 Days of Gifting continues! Your belly is full of chocolate and ice cream and fish and now… now it’s time to really dig in and face the Ultimate Dessert, the Fishy Finale, the Big Sundae… but is it really in you to flambe Twig’s new fwend? The Last Course for the war is coming! The Frostval Storybook is here, and so is the rare Frostvale House - find it in Chapter 3: Lumps of Coal! This year's Cookie Contest to be judged by the creators of Cookie Clicker! Entering is simple and fun :- ) Make a creative Artix Entertainment Game themed entry and tweet a picture of it with your name to the contest twitter. Words cannot express how grateful we are for the opportunity to make these video games with you. We are now building something we never dreamed was possible. How crazy is it that you got us greenlit on Steam? WE ARE GOING TO BE ON STEAM!!! Look how far we have come-- and it is all because of you. We will never forget that… we never do. Break out the SLAY bells and gear up to grind down the most ice-cold villains of the year, heroes! 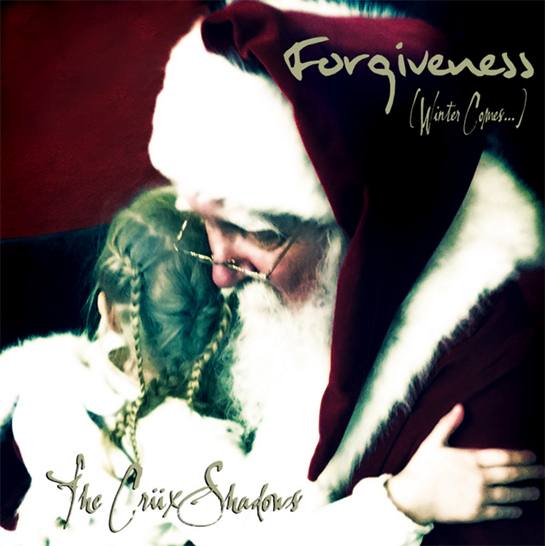 We've got wicked-cool holiday releases going on RIGHT NOW and lasting through January 1st. Don't miss a moment... or a present! After disobeying the Queen of Monsters, Karok the Fallen and the Frostspawn Horde descend upon Cryostorm Village to locate the next Champion of Ice… and DESTROY THEM! The boss battle begins tomorrow! Zorbak has traveled back in time to stop Frostval before it even begins! (Mehehehe!) Your mission is to prevent him from reaching Stollen and changing the face of Lore... FOREVER! Open up the December Golden Giftboxes and find the elite Icy Dragonslayer Armor! The Frostval bells are ringing and Icemaster Yeti, Chilly, and the Frostvale moglin children are playing in the snow! One poor, lonely, fish-smelling yellow moglin is feeling left out though… but he’s going to make fwends… no matter what! Arm thy spatula! Equip your cooking apron! And start your ovens! This is the 2015 Artix Entertainment Creative Cookie (and various holiday dessert) Contest! Cookies may be sweet, but Victory is sweeter. In years past, this highly-anticipated and highly-caloric contest has delivered a scrumptious surge of cookies, pies, cakes, CHOCOLATE! !, brownies, cupcakes, and various holiday desserts all created in an Artix Entertainment theme. We’ve seen everything from Moglin Muffins to Book of Lore Brownies to NPC Cupcakes and…wait, why am I telling you about it when I can just SHOW you!?! MORE WINNERS OMG YESS I LOVE COOKIES! THEY EVEN MADE A MOVIE ABOUT COOKIE WINNERS AHHHHHH! Who says you can’t have your cake and eat it, too? Not us! 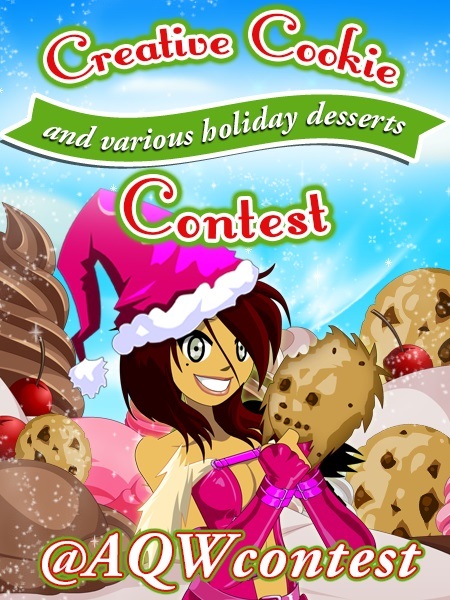 We know how much you love winning, and we know how much EVERYONE loves cookies, so we invite you and your friends to enter the 2015 Artix Entertainment Creative Cookie (and various holiday desserts) Contest! Start: Now! What are you waiting for? GO GO GO! End: Thursday, December 31st, at 11:59pm Server Time (EST). These rules MUST be followed exactly for your edible entry to be eligible. The easiest way to make sure your hard work gets judged: read all of the rules before submitting your entry! It’s just that simple, so let’s get started. Your dessert MUST be created by YOU. Include your Character Name next to your delicious creation. You can use an index card, piece of paper, or icing signature that says your AQW Character Name alongside your tasty treat. Your dessert MUST be created in an Artix Entertainment theme. Create anything you want from any Artix game or any Artix mobile game! Maybe it’s an NPC from AQW, or a monster from Battle Gems, or even a really awesome sword from our newest game up on Kickstarter, AdventureQuest 3D! Your canvas must be an edible holiday dessert. We accept all kinds of desserts, like cookies, cakes, pies, brownies, ice cream, cupcakes, and pastry. Mmmm, get creative! High quality photos RULE! The more clear the picture, the better and tastier your dessert will look, upping your chances at winning the Grand Prize. Tweet it to @AQWContest! Upload your picture and send us a tweet at www.twitter.com/AQWContest to enter! Get ready to deck your opponents and wreck the halls as we bring you all-new releases to chill and thrill you! Artix Entertainment's holiday releases continue this week with more quests to complete, bosses to slay, and gear to unlock! Frostval 2015: Assault on Cryostorm! Last Frostval, Karok the Fallen lead his Frostspawn Horde in an attack on our world. This year, he’s back and he’s hunting for the new Champion of Ice! Cryostorm village is right in the middle of his warpath, and it holds information you AND Karok seek! Help the people of Cryostorm prepare for Frostval... then battle to save them from the attacking horde! Find the Lore Wars VII gear in the December Specials shop in your game menu! Don't miss the NEW gear from Nulgath in Quibble Coinbiter's 2015 Frostval Rares shop in Battleon! Unlock the Cryostorm Wolf Rider Set! Dominate the entire island of Snowspire Peak from the back of your dire wolf companion! Starting tomorrow, December 18th, unlock the Cryostorm Wolf Rider gear starting when you buy any AdventureCoin or Membership upgrade worth $10 USD or more! Get the Wolf Rider armor, Helm, Axe, and Pet with a 2000 or 5000 AdventureCoin package, or a 3 or 6 month membership package! Stollen Fruitcake + December Golden Giftboxes and more! Zorbak has traveled back in time to stop Frostval before it even begins! You must stop him before he reaches Stollen and changes the face of Lore forever! Also, in honor of the new Star Wars movie, the Kallus Knight Face will be available in Warlic’s Shop for a limited time! A special, elite armor specializing in defense against the frigid elements! This special blade adds the element of Ice to your Dragonslayer offense! The Frostval Storybook is here! The rare Frostvale House Shop is now available in Chapter 3: Lumps of Coal! We hope ur weady fwor ice cweam! 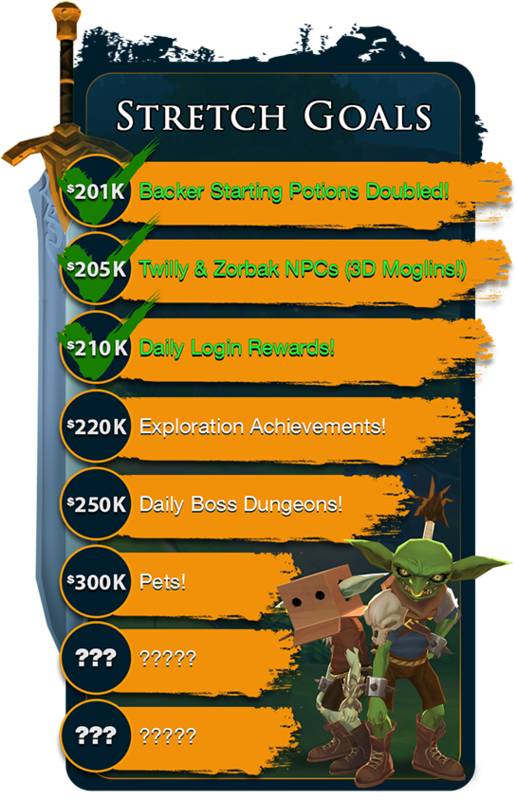 AQ3D Kickstarter: Fully Funded and STRETCH Goals! That's right, heroes! Your faith in AQ3D is paying off big time and together, we have reached our AQ3D Kickstarter goal of $200,000 in backer pledges! But that doesn’t mean we’re done - we’ve just released our Kickstarter stretch goals! The more we can continue to raise with your help, the better AQ3D will become! Kickstarter Explosion: Community power is over 9000! Read more about what comes next for the AQ3D Development team in Cysero's blog post on AQ3D.com! Our quest isn't over once we are fully funded... it means the REAL work begins!